In a few easy steps, you can recover your data from flash drives! 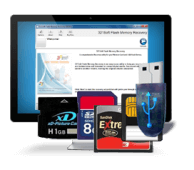 Recover from all types of digital media including USB drives and memory cards! Backup image of the attached storage media for further data recovery! Step-to-Step Data Recovery wizard and Preview files before you restore. 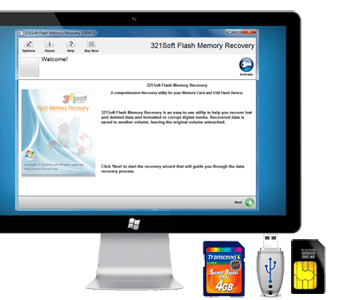 Flash Memory Recovery is a windows product designed for professional and stable data recovery solution. It's able to recover data from USB drives, memory cards, all kinds of digital device that uses flash memory and some peripheral devices. Whatever reason you got files lost, or even your media drive got formatted, or even your USB drives or storages are damaged, 321Soft Flash Memory Recovery may help you get the data back instantly. Recovered all my pictures from a corrupt card. Super easy to use. Recover files and photos from almost all situations in an easy 5 step process: The software interfaces are consists of several dialogs by step-by-step wizards mode to guide the user go over the whole work of data recovering, make the procedure of data recovery work simpler and easier. With only 5 steps, lost data would be recovered and saved. 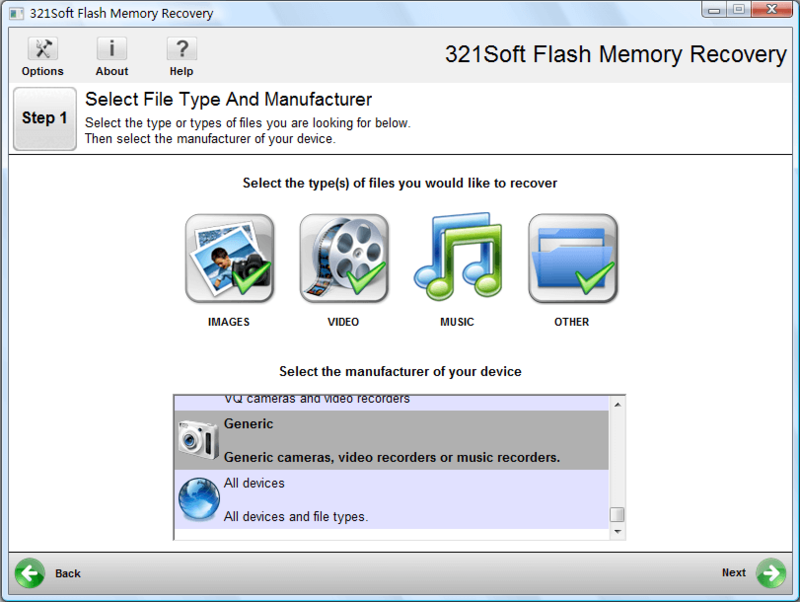 321Soft Flash Memory Recovery can recover files from almost all kinds of storage devices, as long as your computer can recognize the storage devices. Such as USB drives, Memory Cards, SD cards, SmartMedia, CompactFlash, Micro Drives, XD cards, MMC, optical drives, flash media drives, and other external devices. And especially optimized for Flash Memory drives. The lost data's situations of everybody are different, such as, accidentally deleted, files got inaccessible, careless formatted, files lost because of viruses or power outages, files deleted by other applications, or even the USB drive or memory card broken, while Flash Memory Recovery takes into account all of these cases. 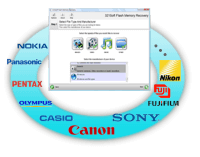 Flash Memory Recovery presets more than 20 manufacturers for your choices, such as Sony, Canon, Nikon, JVC, Pentax, Kodak, Minolta, Sigma, Olympus, Fuji, Epson, etc. This is very useful, if you formatted your camera, or deleted photos / videos from your DSLR camera. By choosing the correct equipment manufacturer, it can speed up the recovery work and save your time. It can recover not only photo and video files, but also office documents, spreadsheets, PDF, Text, audio files, and other archives. As a professional recovery product, Flash Memory Recovery also supports recovering high-definition video, RAW image formats, and output files of all kinds of DSLR cameras like Canon, Nikon, Olympus, Sony, and etc. Using Flash Memory Recovery, it does not bring any risk. It's a completely reliable program. 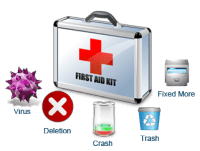 Don't worry that it may destroy your data, actually, it only-read from your memory cards or USB drives, It does not attempt to change or write any information to your USB flash, memory cards, or any other storage devices. 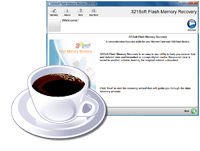 321Soft Flash Memory Recovery allow you to make a back up image file for your flash memory devices. This is an especially useful utility when your flash storage device got broken or inaccessible. You can create a backup image file for your device to bypass bad sectors, then recover data from the image file. During the scanning procedure, you may pause, resume or stop the operation anytime as you like. And you may click a thumbnail to preview. Once you see the photos you want, you can immediately stop the scan and go to the next step. This may save your time. 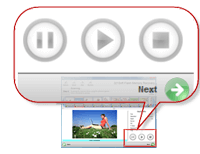 The program has a built-in file previewer that allows you to preview both existing and deleted files. Most of the graphic file types can be previewed to estimate recovery chances. Once you fined the recovery work, the program would offer you a built-in tool which could be used to burn the recovered files to CD or DVD disc. The software provides 23 languages of different countries and regions.